According to ChemOrbis, players in Southeast Asia report that local PP prices within the region have started to regain some lost ground as concerns of supply limitations along with the recent rally in upstream costs persuaded sellers to take a firmer stance on their prices. A distributor based in Vietnam said that local PP prices have risen by around VND400,000/ton ($19/ton) compared with the start of the week. “Overseas sellers are offering in smaller quantities and this fact, along with the recent firmness in energy markets, has persuaded some buyers to return to the market and replenish their stocks,” the distributor stated. A woven bag manufacturer confirmed seeing a lower number of offers from overseas suppliers. In Thailand, a distributor reported receiving offers for domestic PP with THB1000/ton ($31/ton) increases. “A domestic producer reportedly suspended their sales today and informed their customers that they will return to the market with new prices next week. Demand has improved a bit as sellers are returning to the market to replenish some stocks while local stock levels are a bit limited. We are not offering to the market now as we anticipate seeing higher prices next week,” the distributor stated. 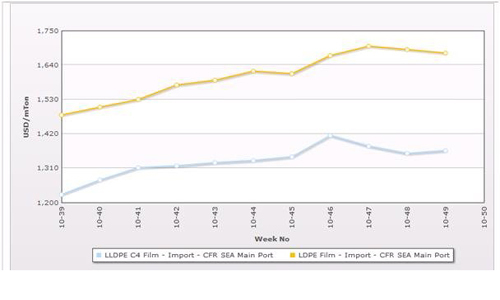 Another distributor reported receiving local prices with an increase of THB1500/ton ($46/ton). “PP supply is tight as we hear that a domestic producer is undergoing a scheduled turnaround at one of their plants while some other producers have reduced their operating rates,” the distributor commented. A woven bag manufacturer in Indonesia said, “A local producer is facing some production issues and this has resulted in some supply tightness. We are maintaining a cautious stance towards the market these days as we feel that the overall trend is still uncertain.” A source from a domestic producer said that they raised their prices by $20/ton on the week, citing firmer regional trends and relatively short supply as support for their price hikes. In Malaysia, a distributor also reported seeing some tightness in the local PP market as per ChemOrbis. “We hear that local producers have concluded a good number of export deals, which has resulted in reduced availability to the local market. We are seeing better demand in February compared with the previous month,” the distributor stated.